Courtlandt Crescent/Melrose Commons. Image: Courtesy of HPD. Project will include two connected buildings and more than 200 units of low- and moderate-income housing. The City Council approved the Department of Housing Preservation and Development’s proposal to allow Phipps Houses to build a 217-unit affordable housing project in the Melrose section of the Bronx. The two-building development, known as Courtlandt Crescent, will wrap around the northeast portion of a block bounded by East 161st and East 162nd Streets and Melrose and Courtlandt Avenues. The project will include 22 studios, 59 one-bedroom apartments, 115 two-bedroom apartments, and 21 three-bedroom apartments. The apartments will be marketed to families earning up to 60 percent of the area median income. Phipps will provide an underground parking garage and space for a 10,000 sq.ft. early childhood center administered by the City’s Administration for Children’s Services. 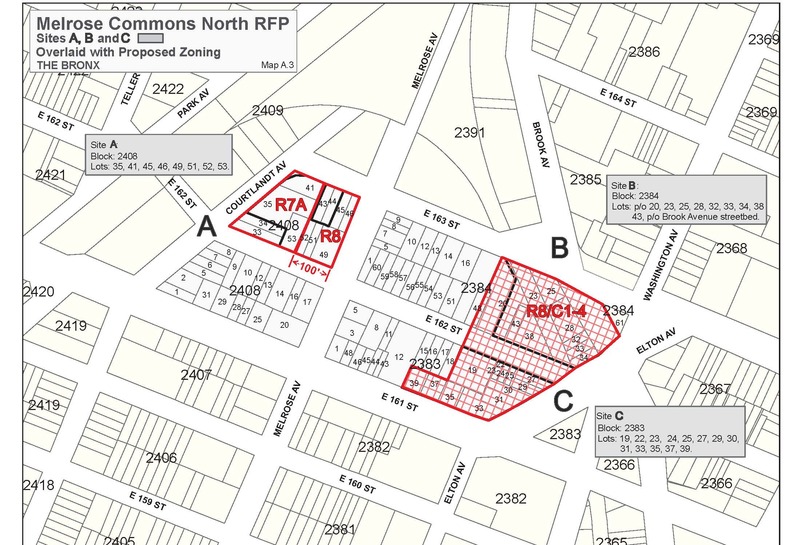 HPD requested that the City replace the site’s R7-2 zoning with R7A and R8/C1-4 districts and amend the height and setback rules of the Melrose Commons Urban Renewal Plan. The plan received support from the community, and the City Planning Commission unanimously approved the project in February 2011. 8 CityLand 25 (March 15, 2011). No one opposed the project at the Council’s Planning, Dispositions & Concessions Subcommittee hearing, and the full Council unanimously approved the proposal on March 23, 2011. Council: Courtlandt Crescent/Melrose Commons (March 23, 2011) (Architect: Dattner Architects).